Navigate the changing world of fire alarm and signaling systems with help from the experts who know NFPA 72 best. Now in its 9th edition, this renowned full-color Handbook from NFPA® helps you answer questions, verify interpretations, and apply the 2019 edition of NFPA 72 correctly from the start. Efficient design and installation of fire alarm, carbon monoxide, and emergency communications systems require a clear understanding of provisions and the "why" behind compliance. Nothing compares to the National Fire Alarm and Signaling Code Handbook for solutions and expert support. The full text of the 2019 edition of NFPA 72 provides the latest requirements for the application, installation, location, performance, and inspection, testing, and maintenance of fire alarm, carbon monoxide, and mass notification systems and components. Authoritative commentary -- written by experts -- gives you an insider perspective. "Closer Look" features provide in-depth, detailed explanations. Charts, tables, color photos, and other graphics clarify concepts. Code changes are shaded, so they're easy to spot. System Design Tips help architects and engineers avoid common errors in application that can result in costly delays or charge backs. Updated FAQs answer questions from the field. Code excerpts from other standards are highlighted in the commentary providing better discussion context without the need to locate other documents. The "NFPA 720" icon indicates requirements added to the Code from NFPA 720, Standard for the Installation of Carbon Monoxide (CO) Detection and Warning Equipment, which has been withdrawn. The "FM" icon indicates material in Chapter 14 of special interest to facility managers. Annexes address performance-based design, and voice intelligibility for voice/alarm systems. Technical changes from 2016 to the 2019 editions of NFPA 72 are explained, including major changes such as carbon monoxide detection incorporated from NFPA 720. Greater explanation and discussion pertaining to fire service access elevators, occupant evacuation elevators (OEE), and occupant evacuation operation (OEO). Changes pertaining to Ethernet wiring for fire alarm systems and mass notification systems are explained and detailed in the commentary. Get the facts you need to work confidently and correctly as you apply the most advanced edition of NFPA 72. Interested in other editions of the NFPA 72 Handbook? Use the drop down menu above to select the edition year you need. 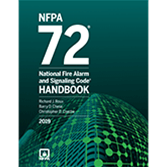 Preview the 2019 NFPA 72: National Fire Alarm and Signaling Code Handbook. Get advanced knowledge about new technologies and innovative fire alarm applications in the 2016 NFPA 72® Handbook. Access a powerhouse of support for correct design and installation of fire alarm and emergency communications systems in the 2016 National Fire Alarm and Signaling Code® Handbook. Now in its 8th edition, NFPA®'s exclusive full-color Handbook helps you answer questions, verify interpretations, and comply with the 2016 edition of NFPA 72. Nobody knows the Code better! The full text of the 2016 edition of NFPA 72 provides the latest requirements for the application, installation, location, performance, and inspection, testing, and maintenance of fire alarm and mass notification systems and components. Authoritative commentary written by experts gives you an insider perspective on NFPA 72 Get additional information about the Code's first-time coverage of Class N circuits along with other major changes. Code Update icons indicate where a significant change in the Code has occurred. Code excerpts from other standards are highlighted in the commentary. All-new supplement Class N Circuits - Using Networks for Fire Alarm and Mass Notification Systems helps you work with the Class N circuits in revised Chapters 12, 21, 23 and 24. Supplements address performance-based design, voice intelligibility for voice/alarm systems, and -- for the first time -- an overview of technical changes from 2013 to the 2016 editions of NFPA 72. Navigate the changing world of fire alarm and signaling systems with help from the experts who know NFPA 72 best.